Los Angeles (AFP) - Shaquem Griffin's odds-defying football journey is set to continue after the linebacker who lost one hand at the age of four was drafted Saturday by the Seattle Seahawks. The Seahawks chose Griffin in the fifth round (141st overall), making him the first one-handed player ever selected in National Football League entry draft. 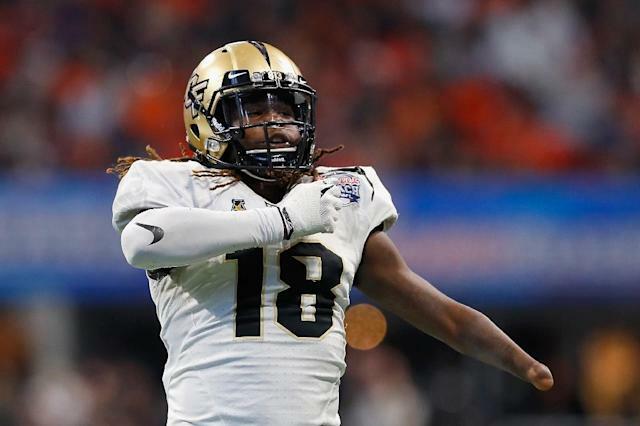 Getting picked was a dream come true for Griffin as he joins his twin brother, Shaquill Griffin, who was drafted by Seattle in the third round last year. "That was the phone call I was waiting for my entire life," Shaquem Griffin said regarding the call from Seattle general manager John Schneider when he was chosen. "I literally broke down after that. I couldn't breathe. I didn't know how to talk, I mean, I was just lost for words." Griffin's left hand was amputated when he was four because of a rare birth defect called Amniotic Band Syndrome. The Seahawks envision Griffin contributing as a pass-rushing outside linebacker and on special teams. Seattle head coach Pete Carroll said Griffin has great speed, is mature beyond his years, and they are going to try to put him in situations where he can succeed. "He will be a big factor in special teams. We are going to try to put him in spots where we can utilize the great speed he has. He is as fast as you can get as a linebacker," Carroll said. "He is an extraordinary young man. He is an explosive, talented guy and he backs it up." Shaquill Griffin, who was born one minute before his twin, was also overjoyed. Shaquill said he lobbied the Seattle coaching and scouting staff to pick his brother. "And they continued throughout this whole process to let me know how much they loved my brother, how much they loved my family. "I'm glad they made this happen," Shaquill said. "It's a dream come true, not just being drafted, but being with my family and bringing my brother back home." Based on his superb US collegiate career, Griffin could be up to the task. He enjoyed an outstanding career at the University of Central Florida, where he appeared in 39 games with 26 starts, amassing 175 tackles, 18.5 sacks two interceptions and 11 passes defended. The 6-foot (1.8m), 227 pound (102.97 kg) player impressed at the NFL scouting combine, clocking a blazing 4.38 sec in the 40-yard dash -- first among all linebackers present.